The final Year 11 assembly before the start of the GCSE exams certainly grabbed students’ attention! Our Year 11 girls received positive messages from staff and students today in a special assembly held by our KS3 students. 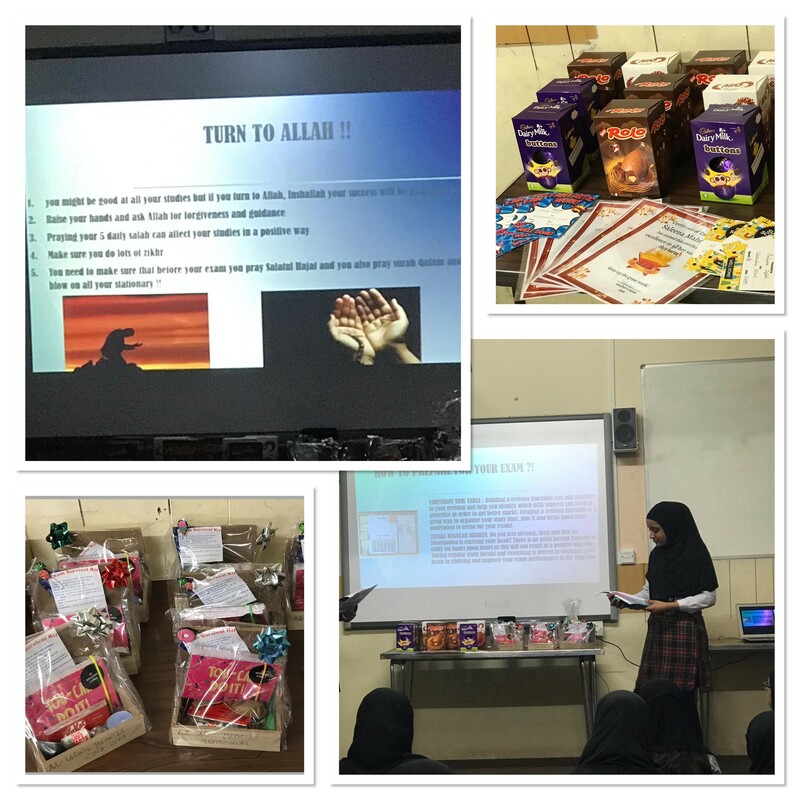 They were gifted with a ‘Getting ready for Exams’ kit which included Dua Cards, Revision Cards, sweets and chocolates. “I tell you every lesson to believe in yourself, because we all do. A positive mind-set gives the greatest results. We have seen you achieve and also struggle. However, keep on pushing these last few weeks and do the best you can. Then you get the long well-deserved rest! You are always in our duas! Each and every one of you is more than capable of achieving the best results. You’ve all put a lot of hard work and effort into your studies, just plough through these last few weeks with hard work and determination, then enjoy a well deserved break. Believe in yourself, try your best and leave the rest to Allah. Good luck, we know you can do it! My best wishes are with you! Do your best and you’re all in my duas! You’ve worked really hard and I am confident that you all can do this. Believe in yourself and you’re already halfway there. I hope you all achieve the best results as you all truly deserve it!